On a cool afternoon in the early 80s, I unrolled my reflective tanning blanket to sunbathe at my family’s Wisconsin cottage. For entertainment, I’d grabbed the portable transistor radio and four fresh AA batteries. The clearest station on the dial wasn’t music, but WGN, so I listened to a live Cubs broadcast from Wrigley Field. I was captivated. Ryne Sandberg led the team to a win, Harry Caray’s sloshy speech gave the commentary, and everyone raised their voice during the seventh inning stretch. I remember it clearly because it was pure magic. This teenaged-girl-from-Minnesota-now-living-in-Wisconsin fell under the Chicago Cub’s spell. I’d never visited Wrigley Field at that point, but something about those Cubs grabbed me and didn’t let go. Several years later, I moved to Chicago and married into a family of life-long Cub fans. Both sides of my husband’s family followed them. Uncle Marv—who’d moved to California—attended Cub games out west. He loved nothing better than getting up to the broadcaster’s booth to have the announcers send a greeting over the airwaves to family back home. 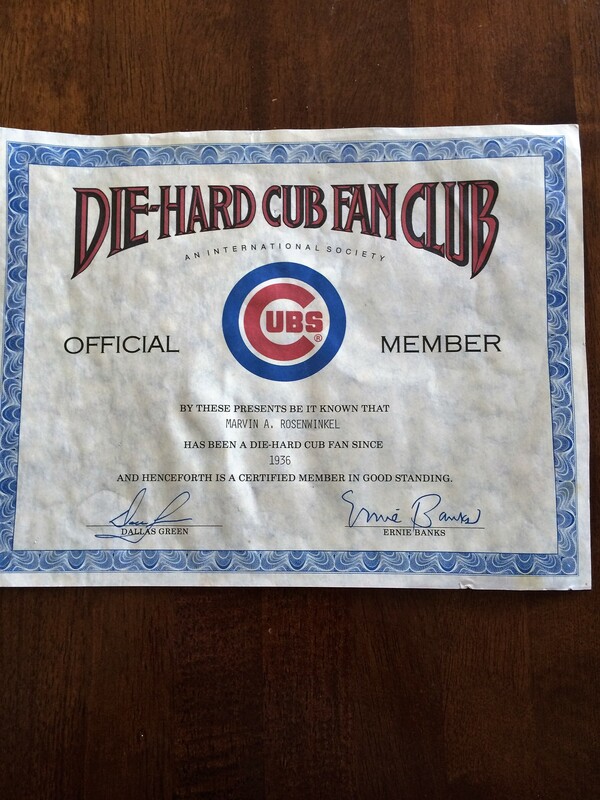 I cherish the memorabilia he gave me, including his Die Hard Fan Club certificate. Uncle Marv passed this Spring. A cousin made sure his graveside flew the W when they won the pennant. I swear I heard his gravelly shout, “C’mon, Cubs!” throughout the series and his hearty Ho-Ho laughter amidst the final, riotous game 7. Holy Cow, indeed. Baseball is a sport, yes, but it is also a pastime that runs through the blood of many families. Its pace and history seem almost misplaced in today’s instantaneous, ever charged world. The game, after all, remains remarkably unchanged from 100 years ago. The season is long and games take their own sweet time. Yet couldn’t we all benefit from more slow-me-down pastimes? Wouldn’t a little more team playing and patience at the plate help each of us? Our world seems woefully absent of both lately. Nevertheless, this series…and the road leading there…changed something in me. It restored my hope. During this current political cycle of divisive, ugly arguments, the Chicago Cubs made me believe in something good again. My heart and soul–depleted by the continuous barrage of incivility through social media, television, and everyday conversation—suddenly saw possibility. Just baseball? I don’t think so. This team overturned 108 years of disappointment. One hundred and eight! And joy, hope, decency, and possibility rushed toward each of us who waited for this day. Listen, I’m not interested in your voting selections. That’s between you and your ballot. Yet when we are done, some Americans will be jubilant and some will be disappointed. Either way, l plan to raise my game on this. I’m going to focus on the positive. There is, afterall, so much to be joyful about each day. Today—for me—it is the fulfilment of a long-held baseball dream, but perhaps tomorrow it’s a child’s laugh, the blue sky, my dog’s wagging tail, or the smell of morning coffee. I plan to let joy, magic, and possibility win, even if my political selections don’t. Last night, amidst my neighborhood’s fireworks explosions and cheers of joy, I felt the energy shift around me. I’m choosing to believe in my dreams, even if they don’t come true in my lifetime. Even if they take 108 years to fully rise. Well said Katie. I deeply believe that this World Series and this Chicago Cubs team brought hope, happinesses and faith back into the lives of thousands. Couldn’t agree more, Sally! Thank you! Incredible! Had chills throughout and couldn’t agree more. Extremely well written and the Cubs win does feel like “a whole new world” of postivity. Patience is the name of the game in life and the Cubs are proof of that! Thank you for sharing your thoughts. Thanks, Matt! So glad you felt that same wellspring of good. I think we are on to something! Well put Katie, we all have a couple Uncle Marv’s in our life! I remember listening to a Cub Dodger game in LA with Pat Hughes and Ron Santo broadcasting. During some down time in the game Pat announces Marvin Rosenwinkel is here today cheering on the Cubs!! There was some brief funny discussion between the two about the name Marvin Rosenwinkel!! Before the days of social media there was genuine excitement hearing your favorite announcers tell you your uncle is at the game.